Founded in 1977, Signorello Estate is a leading Napa Valley producer of Cabernet and Chardonnay. Co-founded by the father-son duo of Ray Sr. and Ray Jr., Signorello Estate stands for French style wines with finesse created from 100% estate grown Napa Valley fruit. The Estate Experience begins with a vineyard tour and an overview of Signorello Estate’s history, as well as Ray Signorello’s vision for the winery’s rebuilding and future. Following the tour, guests will be welcomed into the Estate Room, which boasts stellar vineyard views. Estate Experiences are semi-private tastings for up to eight people and are held Thursday-Monday at 10am, 1pm and 3pm. The price is $100pp and features four wines paired with small bites. Reservations for the Estate Experience are only accepted over the phone, and prior reservations are required; please call 707.255.5990. Join us at our Tuscan-style winery perched above the Silverado Trail with stunning views of the Napa Valley. Your attentive Estate Ambassador, a skilled wine educator, will start your visit a tour of our estate vineyards and crush pad. Then enjoy a wine tasting experience that always includes a food pairing crafted by our Executive Chef to bring out the nuances of our delicious wines. Wine Education: Every visit includes a tour of our estate vineyards and a stop at our wine-making facility. 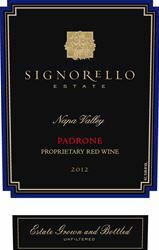 To join the wine club, visit www.signorelloestate.com or call 707-255-5990. Allocation Program : Your membership entitles you access to our allocated wines not available at retail. As a valued member, you’re also part of our family, enjoying upgraded shipping, invitations to library tastings with Ray Signorello and two complimentary tour and tastings on future releases (twice per year). Release offerings are in April and October, the only way to access the wines. Once ordered, you may re-order, inventory prevailing. Signorello Estate is certified under the Napa Green Winery Program by the Napa County Department of Environmental Management (DEM) and the Association of Bay Area Government’s (ABAG) Green Business Program and completed all the regulatory components needed for environmental sustainability. These components included developing water and energy conservation methods, preventing pollution, and reducing solid waste. In addition to developing sustainable winery practices, this program is set to become the standard for the state of California. Signorello Estate is certified under the Napa Green Certified Land Program. Signorello Estate has created and implemented a customized farm plan with measured results that addressed all aspects of its property, vineyard land as well as non-farmed land, including practicing soil conservation, water conservation, stable drainage, riparian corridor enhancement, fisheries and wildlife habitat enhancement and long-term improvement and sustainability.